Do you want to stay up to date with the WHMCS updates without the worry of losing your custom code in the core files? 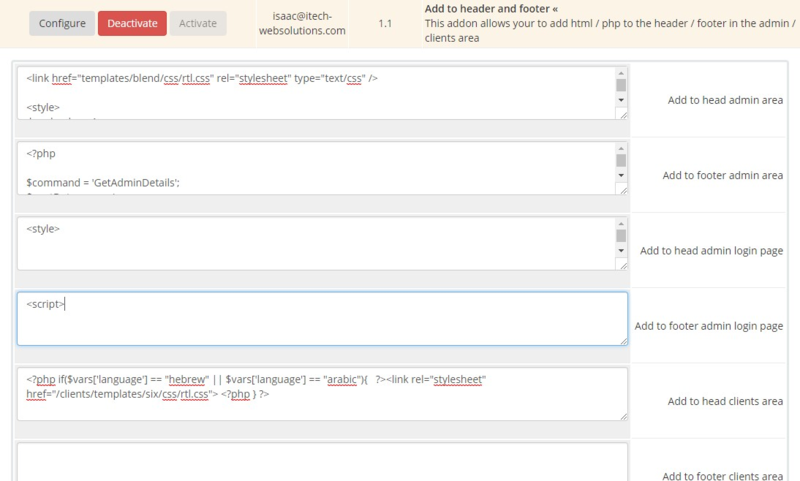 Do you want to change the template to another template without to move again your custom codes in the header or footer ? Do you want to customize the admin login page? This is the addon for you! Everything is working dynamically in real time! the addon is checking automatically the PHP Syntax before running, for errors that can break the system. An option to disable the module in real time from outside the system. just unzip it in the main WHMCS folder, then go to the modules configurations (/admin/configaddonmods.php) and add the custom codes there. Easy to install and adds Facebook Pixel easily to header on every page without fuss.